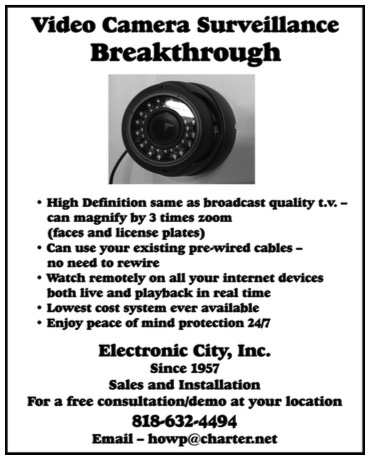 Electronic City has been providing low cost security cameras and monitors to businesses and state-of-the-art training. 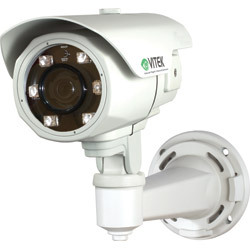 Our products cover a full range of CCTV solutions in every marketable aspect and our service is second to none. 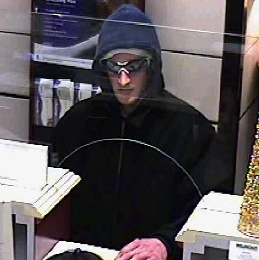 Our new HI-DEF cameras and recorders can help the POLICE Identify any suspect with Hi Definition Video capture. Don't let your old Analog system defeat your efforts of capturing and prosecuting the suspects. Howard Pollyea is a man that thrives on activity. After 58 years of NEVER sitting at his desk while manning the helm of Burbank’s infamous Electronic City, he “re-tired” for two weeks, and during that time, decided to bring his storefront directly to the customers. Today, Electronic City is a sur-veillance specialty firm for resi-dential and commercial properties. Of course Howard maintains that systems like these don’t nec-essarily prevent home/commercial invasions, but they can definitely deter an intruder to move onwards. “My goal is to continue the work ethics from the store: to listen and be involved in a very one-to-one ratio with my clients and to provide them peace of mind.” Towards that goal, Howard will bring the equipment to your house and demo it at your home or business so you can see it under your own specific circumstances. For a thorough consultation and appraisal of your home or building, give Howard a call at (818) 632-4494, or email him at howp@charter.net and get started towards the peace of mind that you deserve. All information contained on this web site is Copyright 1997- 2005 Electronic City, Inc. Some images, logos or wording may also be copyrighted / trademarked by the respective owners. No material on this site may be used without the written permission of Electronic City, Inc. Prices subject to change without notice. Disclaimer: Electroniccity.com attempts to be as accurate as possible. However, Electroniccity.com does not warrant that product descriptions or other content of this site is accurate, complete, reliable, current, or error-free. If a product offered by Electroniccity.com itself is not as described, your sole remedy is to return it in unused condition.